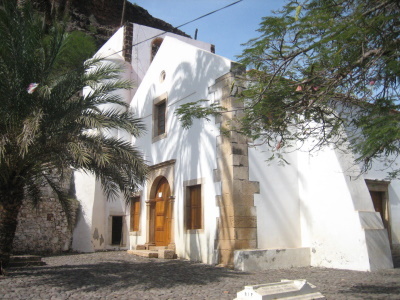 Cidade Velha, Historic Centre of Ribeira Grande, was an important Portuguese colonial settlement and the first European town to be built south of the Sahara. After the (then uninhabited) island was discovered, the city was named Ribeira Grande (Portuguese for large river) by António da Noli, in 1462. In 1466, the settlement became an important port for trading slaves from Guinea-Bissau and Sierra Leone to Brazil and the Caribbean. Transcontinental slavery made Cidade Velha the second richest city in the Portuguese realm. Cidade Velha's port was a stopping place for two great navigators: Vasco of Gama, in 1497, on his way to India, and Christopher Columbus, in 1498, while on his third voyage to the Americas. Cidade Velha has the oldest colonial church in the world, constructed in 1495. It seems Cape Verde is not a very popular country in this community. It is not surprising since there is only one World Heritage Site and chances for the inscription of the second one (Tarrafal) are vague. But if you do not follow typical beach vacation on Sal or Boa Vista, there is a lot to see and there is a surprising variety of landscapes in this small country. Cidade Velha, the only WHS of the country, was the first settlement of the archipelago and the first colonial town south of Sahara. The Portuguese, striving for piety up to exaggeration, built here more churches than secular buildings. Some of them, such as Convent of Sao Francisco, or Church of Nossa Senhora do Rosario (the oldest colonial church in the world) are part of the inscription. The other one – Se Cathedral (again the first colonial cathedral) is nowadays nothing but ruins. All inscribed properties are withing the walking distance and can be convered in a couple of hours. The best preserved is Fort Real of Sao Filipe, a stronghold built on the steepy hill nearby (the pave is very bad and we almost surrendered descending it with baby stroller). Cidade Velha lost competition with Praia and now is nothing but a small but nice village, perfect for a half a day trip from the capital. After visiting the inscribed sites it is worth to sit in one of the restaurants in the center, with a sea view from one side, and public pillory (another inscribed site) from the other. So Durian’s “inside information” suggests that “Cidade Velha, Ancient Ribera Grande” in Cape Verde might be proposed for inscription in 2009 (see Forum “Nominations for 2009”). For the benefit of my “Visited count” I certainly hope so, since I visited it in April 2003 – but without any expectation that it might EVER be a WHS! In fact Cape Verde only got round to proposing a T List in 2004. Interestingly, however, this small island country had tried to get this very site inscribed many years earlier. I quote verbatim the minutes of the Bureau meeting at Paris in July 1992 “The Bureau considered that, in spite of its indisputable historic value, the property did not meet the criteria for inscription on the World Heritage List”. And at the WHC itself at Santa Fe in December 1992 “The Committee noted that there was no protection or management plan for this cultural property and that it did not meet the criteria for inscription on the World Heritage List”. Well that’s pretty clear then isn’t it! But, as we have noted before, “No” doen’t have to mean “No” where the WHC is concerned! Political imperatives can change a “no hoper” into a “star” and a bit of coaching in the preparation of good (and voluminous) documentation from experts in the field can help overcome doubts! Well – what is there at Cidade Velha? It is situated on Sao Tiago, the largest island of the Cape Verde archipelago – and also the most “African”. We arrived by boat into the capital – Praia. Cidade Valha is situated 15 kms outside and was the original capital. Ribera Grande” is a deep valley at the bottom of which nestles the village of Cidade Velha (c 2550 people) – which was originally named after the valley until the passage of time and the move of the capital to Praia justified the name change. 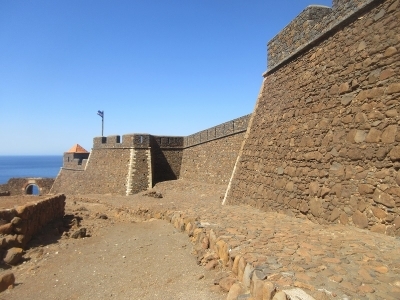 On the desert plateau, 100 metres above, is the Portuguese “Fort Real de Sao Filipe” dating from 1590 (built, perhaps, in response to the town’s sacking by Sir Francis Drake?). This building was in excellent condition when we were there, having been restored in 1999 with Spanish help. It is pleasant enough and commands fine views over the valley and the coast – but the List isn’t short of Portuguese forts – see Connections! Cidade Velha is significantly older and more interesting – at least for its historic position in 15th century exploration and settlement. The Cape Verde islands were uninhabited when discovered around 1460, settlement began in 1466 and Columbus and da Gama visited this very port on their voyages of exploration. The church, constructed in 1495, is apparently regarded as the “oldest colonial church” in the world (But I wasn't aware of this when I saw it and can't say that I particularly remember the building other than its general existence!). Slavery started very early as the Portuguese explored Africa and the islands became both a destination for slaves and an intermediate “warehouse”. Along with the Fort and the Church the other main “historic sight” was that of a post in the main square to which slaves were once chained. But the atmosphere which came across to me during a half day visit to the fort and village was more that of a sleepy African, or perhaps more specifically, Brazilian village (photo). So, in conclusion, there is not a great deal to “see” in terms of major or outstanding sights. The importance, such as it is, lies in Cidade Velha’s early role in European expansion:- the route to Africa and the Americas, slavery, settlement of new lands, the creation of a Creole nation etc. There is plenty there for UNESCO to view with satisfaction and, provided the concerns expressed in 1992 about the lack of a Management Plan” etc have been overcome, I would expect this site to be viewed favorably, coming as it does from a small “African” country with no other inscribed site. The more interesting questions might be why it was not regarded as meeting the criteria in 1992 and whether/how interpretation of the criteria has altered and developed during the intervening years!